Glass Pantry Moth Trap - The gorgeous solution for most types of moths in homes ! Decorative AND discreet ! 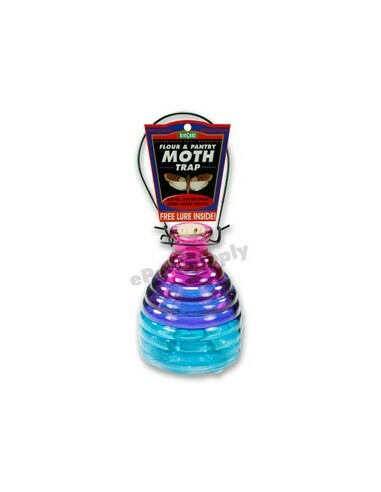 Glass Pantry Moth Trap is an attractive 5 inch tall glass jar that looks great hanging by a window or sitting on a counter. This is a safe and effective alternative to capture most types of moths found in kitchens and pantries. In fun and different citrus colors, this attractive glass trap eliminates your moth problems without advertising it. Very easy to use, it works on the same principle as wasp or or fruit fly traps: Once attracted by the bait, they enter the bottom hole and can't fly back out. Simple and easy to use, add soapy water, set the trap on a counter, then let the powerful pheromone lure draw moths to the trap where they can't escape. When the trap fills up, rinse it out and add soapy water. The trap includes a lure which is effective for up to 90 days. The Pantry Moth Replacement Lures may be purchased separately. Very easy to use, it works on the same principle as wasp traps; fruit flies, pantry moths attracted by the bait, enter the bottom hole and can't fly back out.